Tuscany is home to some incredibly historic and famous towns which make it such a well-rounded and popular destination. 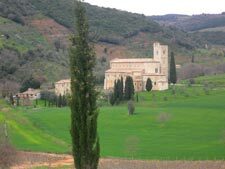 There are a lot of great lesser known towns as well, and I decided to spend a few days exploring these towns to see what would make some interesting day trips for clients staying at Wimco villas in Tuscany. 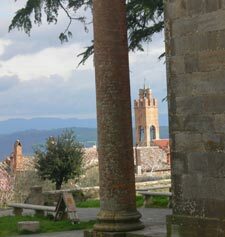 The destination for this trip is Montalcino and I began my trip in Grosseto in Maremma. The towns, and castles, and wineries are bound to catch your eye as you drive through this area, so it is best to just head out and stop in areas of interest along the way. My first diversion was the little town of Paganico right off the highway (SS223) exit for the road to Montalcino. It was just a quaint walled town that is enjoyable to drive through. I also couldn’t help driving though the medieval town of Sasso d’Ombrone and the hill town of Saint Angelo in Colle. As I continued on through the green valleys, I kept getting a glimpse of what seemed to be a large castle on a hilltop. I decided to head that way and was pleased to find it atop a hillside of vineyards. The castle itself used to be a private residence, but it is now owned by the Banfi winery. You can spend a full day here, starting with a winery tour in the morning (by reservation only), then a wine tasting and lunch at the taverna which had a nice menu and really lovely interior. There is also a glass museum housed in the castle and a more formal restaurant with great views for dinner. Based on a recommendation from the gentleman pouring the wine at Banfi, my next detour took me see the church of Sant'Antimo, a beautiful Romanesque church built in the valley. As you travel these roads you will stumble upon plenty of wineries that are open for public visits. I eventually made it to Montalcino, a great wine town and a beautiful village set on a hill. I was long overdue for lunch and chose a nice wine bar located on a busy piazza, Osteria le Potazzine, to have lunch and a glass of Brunello. It's a fun little restaurant because the walls are lined with wines, and they attach a label to your wine glass so that you know what you are tasting if you decide you would like to purchase a bottle. I had the pasta called Pinci which is a specialty of Montalcino, and it's delicious!